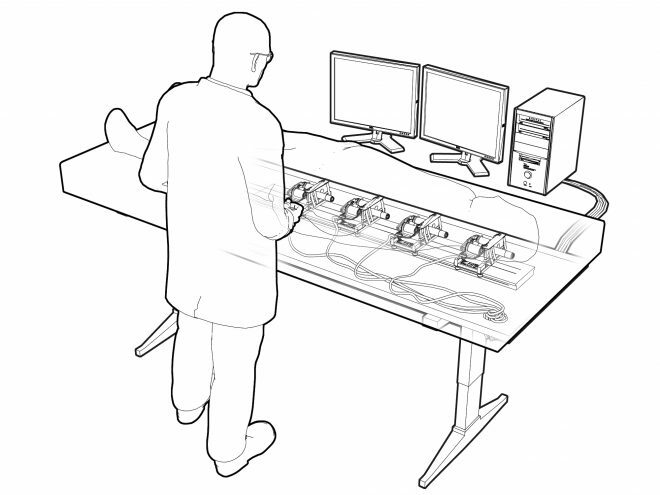 Simplified and much more compact FPGA-based motor control solution made a haptic simulator system 40 times faster. The haptic simulator system in this application simulates the feel of surgical tools in heart and vascular surgery. It is used in preparing for actual operations as well as in training. Data on the patient’s inner organs are stored in a PC system, which gives the individual conditions for a particular treatment. All motion is visible on the PC screen. For a simulated feel close to reality, the system must be able to produce a number of different effects on the tools used by the surgeon or student, for example friction and vibration. One difficult issue is the simulation of a state without friction, particularly for small tools, since low or no friction must result in very little or virtually no signal feedback. The original system consists of three simulator carriers. For each carrier there are three small dc motors, and each motor has a separate microprocessor controller. Because of the space needed for the nine controllers they have to be mounted in a cabinet. The controllers and the motors are connected to each other by a bulky cable set needed for each motor. The controllers in turn are connected to the system PC. The control loop bandwidth is about 2 kHz and the drive architecture is centralized. The mechanical part of the simulator consists of carriers moving on a linear guide, driven independently with different surgical tools connected to the carriers. The system fetches and then holds the tools that are to be inserted into the simulator. The previous design solution did not offer the performance needed for truly good haptic properties, i.e. an experience close to reality. The customer contacted Unjo because of our reputation in developing FPGA based high-end motor control. The development work lasted 12 months, and it was carried out in close cooperation between the customer’s project team and Unjo’s control specialists. 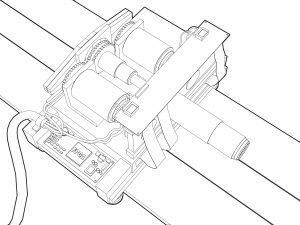 In the new solution the three motors in each carrier are controlled by a single FPGA-based motor controller with extremely high servo performance. The controller is so small that it is mounted directly on the carrier. 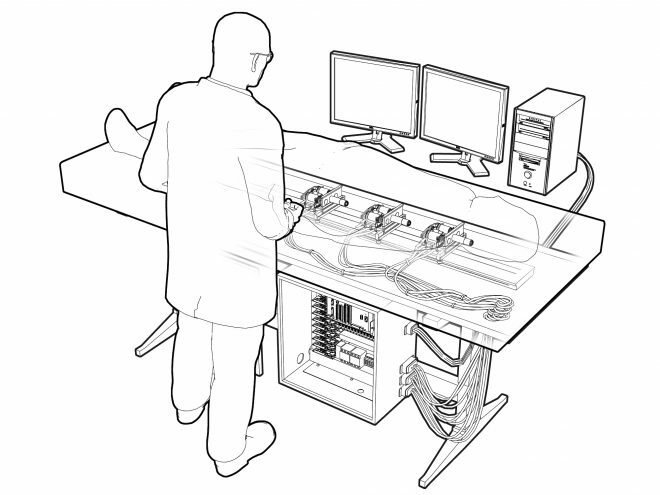 The only moving cabling needed is power and communication to the PC. The bandwidth is up to 40 times higher than for the original system, which results in a system with very high performance and excellent haptic properties as well as a decentralized drive architecture. The customer’s expectations of optimal control were more than fulfilled. The product is very competitive; instead of three carriers the system now uses four, which has improved the product properties even more, with added possibilities for the users. In addition, even more carriers may be added. The system is robust, simple and cost efficient, because the controller is small, light and can be mounted in the immediate proximity of the motors. The minimized cabling reduces cost, assembly time and space needed. Unjo’s proven technology for FPGA based customized motor control together with detailed understanding of customer needs, dramatically improved simulation performance and increased the control loop bandwidth up to a factor of 40, using small motor controllers attached directly to the carriers together with a decentralized drive architecture.